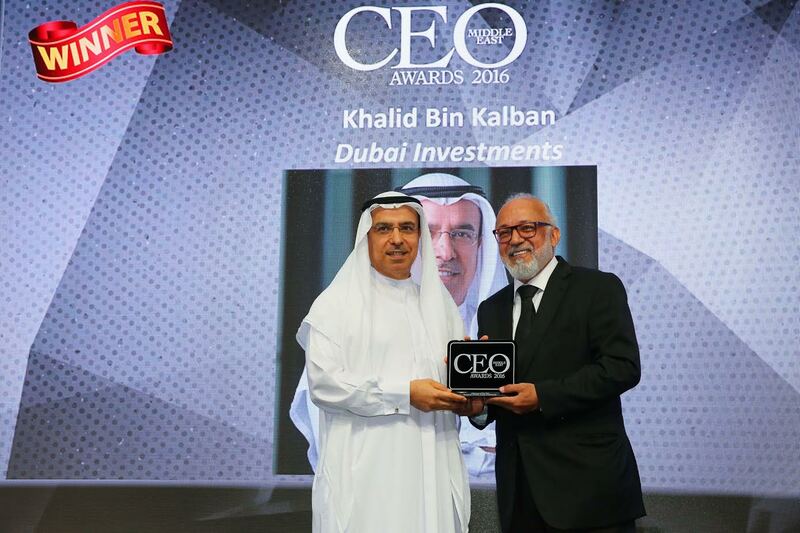 Dubai: Khalid Bin Kalban, Managing Director and CEO of Dubai Investments PJSC [DFM: DIC] – the leading, diversified investment company listed on the Dubai Financial Market, has won the prestigious ‘Visionary CEO of the Year’ award at the 10th CEO Middle East Awards 2016. Kalban received the award at a gala ceremony held on September 19 at Four Seasons Hotel Jumeirah Beach. The Visionary CEO award is in recognition of Kalban’s contribution to the world of business in the Middle East, his visionary initiatives, business acumen and achievements in spearheading the success of Dubai Investments PJSC over the last 21 years. The CEO Middle East awards also honoured CEOs across 14 different categories for their outstanding contribution in enhancing the vibrancy of business in the region. Held annually by ITP Publishing, the CEO Middle East Awards recognizes and rewards success, innovation and ethics in the region.